The Tigrayan People’s Liberation Front and Ethiopian People's Revolutionary Democratic Front (TPLF/EPRDF) is in a precarious position of their own creation. The monster of ethnic hatred and division that they have created could bring destruction to all of us. One of its key components has been a well-calculated plan to divide Ethiopians into “controllable” factions to prevent unity among them as a tactic to control and exploit the masses and Ethiopian resources for personal gain. It is an ideology that has consequences. Exclusion, ruthlessness, repression and corruption has inherent term limits and there is evidence that the time has run out. In our struggle for freedom, justice and democracy, will we Ethiopians understand the bigger challenge to overcome is not the TPLF/EPRDF; but instead, its destructive ideology— a worldview that many have accepted as true? We in the Solidarity Movement for a New Ethiopia (SMNE) believe the most important means for Ethiopians, including those in the TPLF/EPRDF, to avoid the looming “monster” that threatens all Ethiopians is to reject TPLF-constructed divisions based on ethnicity, religion, language, region or viewpoint that exploit our differences and obstruct our view of others as people of God-given value, worth and dignity. Why have we continued to define ourselves according to TPLF brainwashing, despite the fact we have all suffered because of it? Why have we remained captives of a TPLF-designed box that has kept us from recognizing the humanity of others different from ourselves? Why do so many fear what might happen to their own groups should they step out of that box to embrace the value and support the rights of others? Will we simply complain at the same time as we willingly remain captive to an ideology that ultimately could lead to our mutual destruction? Thankfully, some are now rocking the foundations of this TPLF identity manipulation by demanding justice for all and it is shaking up the TPLF/EPRDF as nothing else has done. The recent protests in Gondar and continued protests in Oromia, have demonstrated the deepening gulf between the TPLF/EPRDF and the people of Ethiopia; however, what is a highly encouraging is increasing evidence that some Ethiopians are rejecting the TPLF-impose identities. It is this foundational TPLF strategy that has allowed an ethnic-based minority regime, representing 6% of the population, to dominate the majority for over two decades. Without our unwitting support for this carefully laid out plan to divide, sub-divide and micro-divide us again and again, the TPLF would not have survived until now. In other words, not only are major groups divided by such characteristics as ethnicity, religion, region, politics, viewpoint, and language; countless schisms exist within these groups. Now, the recent protests have shown a perseverance and determination to bring change that is a threat to the TPLF/EPRDF, but the most unsettling part of it, may be the fact that people are speaking out for the rights of others outside their own groups. One sign of that began last November when Oromo students at Addis Ababa University, went to the cafeteria in the school; but, instead of eating, they folded their hands together and held them up above their heads as they all walked out; stating they refused to eat while so many other Ethiopians were going hungry. In doing so, they showed their solidarity with the many Ethiopians facing famine and starvation that was being hidden by the TPLF/EPRDF. In response, the regime security forces brutally crushed them, killing many young people and arresting many others. Many other protests have been carried out since that time regarding issues involving the displacement of tens of thousands of people from their homes in Addis Ababa due to government eviction to make way for other development. According to recent counts, the dead now total over 600 and the number of arrested, over 30,000. Many of the organizers of the protests, as well as some of the top Oromo leaders, are now among those imprisoned. Preceding the July 31 protest in Gondar, in the Amhara region, organizers of the protest requested permission from local authorities to hold a rally there. Their request was not only denied, but it was met with threats of violence from the TPLF/EPRDF regime. The intimidation did not work; however, the TPLF/EPRDF did not use violence against them. The authorities knew if they “crossed the line” and started to kill the protestors, it could quickly escalate as the local citizens of Gondar had promised to defend the protestors. Most Ethiopians have been disarmed, but for some reason, some in this region still possess guns, perhaps from the time of the Derg. 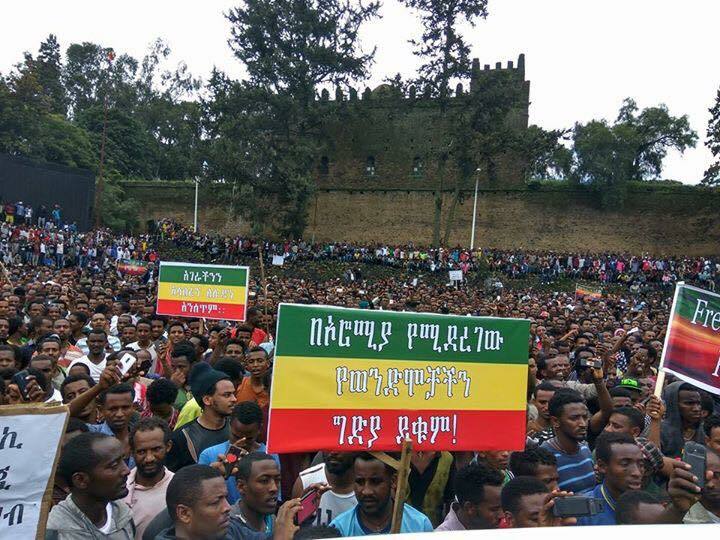 Whatever the reasons, those in Gondar conducted a peaceful protest, ultimately drawing a mass of protestors numbering a hundred thousand according to some reports. Yet, over the same few days, peaceful protestors doing the same in the Oromia region were met with gunfire from TPLF/EPRDF security forces, leading to the death of even more Oromo young people. Some of these were young teens and children. The heart wrenching pictures of the blood-covered bodies of these recent victims—some as young as eight years old— are so disturbing that even viewing them can be traumatizing, especially knowing the loss of these vibrant lives will affect their loved ones for a lifetime. Protestors in Gondar had heard about this and came out ready to speak up for the lives of these fallen heroes and heroines from Oromia; saying, “…the blood spilled in the Oromo region is our blood.” They referred to the Oromo leaders in prison, claiming, ”…These [Oromo] leaders [in prison] are our leaders too.” They called for the release of all Oromo prisoners of conscience as well as the Ethiopian Muslim religious leaders who had been imprisoned for peacefully protesting government interference in their religious affairs. They also called for the release of all political prisoners throughout the country; not only their own. They spoke against the land grabs and displacement in other places and refused to localize injustice to only one area in the country. In another rejection of the ethnic-based federalism of the TPLF, these protestors did not carry an ethnic or regional flag, but instead they carried the original national flag of Ethiopia, one that had been outlawed by the TPLF. The TPLF had replaced the traditional flag with one they designed, adding an objectionable center symbol that some believe has a veiled demonic meaning that runs counter to the religious beliefs of most Ethiopians—both Christian and Muslim. The TPLF/EPRDF forced it on the people, even making it a crime to use the older one— which consists of three large horizontal stripes of green, yellow and red and no symbol in the middle. Authorities believed this would be a “localized protest” over local issues of self-interest to citizens of Welkait, a smaller town near Gondar, or Gondar, or at the most, of those in the Amhara region. The broad-based national emphasis caught the TPLF/EPRDF off guard as protestors literally said they were standing with all the oppressed people of Ethiopia. The Oromo young people did same thing when they spoke out on behalf of the starving people throughout Ethiopia as well as in objection to the unjust displacement of so many people in Addis Ababa. Their example is powerful and is what is really scaring the regime because they will not be able to control where this will spread if others come out as a whole. We applaud these people for doing this. They broke out of the TPLF-imposed identity box. This is the only way to get out of our mess. It is an indication that the peaceful struggle as a means to bring change is possible, but it requires that people stand together as one, under shared values and principles. Failure to do so in the past is the reason why we so readily adopted a formalized agenda of ethnic separatism and advancement, called ethnic federalism, when the TPLF/ERPDF came into power, despite its hidden agenda of empowering a minority — the TPLF—over the majority. HOW HAVE WE BEEN DECEIVED BY ETHNIC FEDERALISM OR BEEN GUILTY OF THE PROMOTION OF OUR OWN ETHNIC AGENDAS? In the case of Welkait, the TPLF/EPRDF wanted to single the people of Welkait out, keeping them weak so as to achieve their own goals to take over the area. Welkait has very fertile land. Despite being part of the Amhara region historically, with its land occupied for generations by Amhara, confiscation of the land has been a long-standing goal of the TPLF. If accomplished, it could even lead to pushing further into the Amhara region, all the way to the border of Sudan, an achievement that could give the Tigray access to an international border if they ever decided to become their own country. As seen before, protests are generated by conflicts such as these, whether in Welkait, Gambella, Oromia or beyond. The TPLF, as the lead player of the coalition of the EPRDF, has a history of pursuing narrow, self-advancing interests rather than creating a fair playing field for all people. When the Derg was in power, years of oppression and injustice, especially targeting the people of Tigray and Eritrea, gave them additional impetus to work towards their overthrow. When the Derg fell, the TPLF and ELF (Eritrean Liberation Front) were ready to move ahead to take power, giving them the opportunity to take control of the whole country. Because of the TPLF’s own inherent weakness as a small minority group, they took multiple actions to neutralize the chief competitor and adversary— the Eritrean Liberation Front—by promoting the ELF’s separation from Ethiopia. This was done even though it was not in the interest of Ethiopians as a whole to be land-locked. Neither was it in the interest of either Ethiopians or Eritreans to come under the leadership of the other. The quick solution was to separate and it has caused grief and suffering to people of both countries ever since. All of this broke down national identity but because it was advanced as the liberation of “nations and nationalities,” it was embraced as “liberation” while actually working to divide ethnic groups so they could not work together and instead to empower the TPLF. They exploited the past wounds and grievances of the Ethiopian people for their own self-power rather than attempting to bring reconciliation. The TPLF/EPRDF then claimed credit for giving the various divided groups their own power. They ensured these groups, especially the largest ones, could not easily unite against the minority-led coalition by ensuring them the “right” to speak their own language, creating an obstacle to communication among groups. This “right” became a denial of opportunity. For example, the Oromo were denied the opportunity to learn the national language of Amhara; instead, promoting the language of Oromia, resulting in limiting the scope of communication so later they could not do well outside their own region. Within the Amhara region, they were not allowed to learn Oromo; yet, in the Tigray region they learned four languages—Tigrayan, English, Oromo and Amhara— very calculating. The language obstacle remains. If they had been genuine, they could have made Oromo a second national language since the Oromo make up the vast majority of the nation’s population. EPRDF coalition partners were limited, but necessary because they supposedly represented the larger, more “dangerous” groups— the Oromo Peoples’ Democratic Organization (OPDM), the Amhara National Democratic Movement (ANDM) and the Southern Ethiopian People’s Democratic Movement (SEPDM) as a whole; but in practice, they have been serving as puppets of the TPLF, encouraged to comply through a reward system of favors and privileges; or the reverse, by threats or intimidation. Other regions have been neglected and excluded because they were called less mature and ready for leadership; however, they were also permanently disqualified from participation in the higher posts within the federal government until today. This discriminatory policy affects Gambella, Benishangul-Gumuz, Afar and the Somali region. This system of rewards and privileges has also been applied to the military to ensure their loyalty to the TPLF regime and to disregard any appeals from their conscience to follow the rule of law. Instead, the rule of law has been defined by the self-interests of those involved; yet, some within the military and security forces may become reluctant to commit crimes against humanity in the name of the TPLF who may likely desert them later if their cases are ever heard in an impartial court of law. When it came to the government; all key positions continue to be controlled by the TPLF although others of different ethnicity are often used to cover up the reality of that control. The TPLF then tells the world they are unified when their hidden agenda is to keep everyone divided by language, region, grievances, and other means while they exploit the resources in all regions of the country. Their underlying policies incite conflict between the people rather than turning against the TPLF or the ideology that leads to their oppression. They also ensure there is no political space or free media to alert people to these conditions. In the name of the war on terror, they are able to keep donor countries as allies. They keep people preoccupied by regional, ethnic and other identity interests. Seasonal solitary struggles have been going on for over 25 years, but people are now coming to better understand this hidden agenda that it is threatening the survival of the TPLF/EPRDF as well as that of the whole country. The end of this pain and injustice will require a different approach. Ethnic-based or other types of seasonal solitary struggles is what sustains the TPLF/EPRDF. This is what led us to establish a movement of the people that advances the interests of everyone because everyone is created equally, but the TPLF wants as in sectors. We the people need a transformation of our thinking leading to a moral transformation to do what is right for all people, not only for ourselves or our own ethnic or other groups. We have been saying this for a long time, but this weekend it was visibly put into practice in Gondar. A CALL TO THE TIGRAYAN PEOPLE AND TO MEMBERS OF THE TPLF/EPRDF: HOW FAR ARE YOU WILLING TO GO TO HOLD ONTO POWER? WILL YOU JOIN OTHER ETHIOPIANS FOR THE GOOD OF EVERYONE, INCLUDING YOUR DESCENDANTS? We in the SMNE urge the TPLF/EPRDF to strongly consider how they might respond in a manner that will change the direction of the descending path to disintegration we have set before ourselves. It is impossible to consider how it might resolve without a deadly collision of vying interests that will wreak destruction, bloodshed and irreparable damage to our country and people on both sides of the confrontation. We believe a collision course can be avoided, but only with a monumental shift in approach, attitude and willingness by all stakeholders, including both the TPLF/EPRDF and the diverse people of Ethiopia. That shift must be to one that upholds the basic rights of all citizens of this country. Can a revolutionary change of heart, mind and practice come to Ethiopia without a deadly revolution that could cause great harm to all of us? Human nature is hard to change; but crisis is a great inciter of change— whether for good or bad. Let this crisis be an incentive to make changes for good we would not otherwise make. What would happen if the TPLF/ERPDF embraced such positive change during a dangerous, yet open window of opportunity such as this? Perhaps other Tigrayans could do their share in working together with the rest of us to make this happen. It is possible! What would happen if the Tigrayan people refused to side with the TPLF/EPRDF any longer? Ethiopia has never been colonized, but it is now internally colonized by the TPLF. What if Ethiopians, with Tigrayans at their side, were to “de-colonize” our country from the inside? It would be a God-given miracle! The SMNE is highly concerned regarding the failure of the regime to listen to the voice of the people. The senseless killing of the Ethiopian people has become routine. Think of those doing the killing in the name of the TPLF/EPRDF. What is the toll to the hearts, minds and souls of these soldiers? Wounding others will backfire, first traumatizing, then hardening those involved. Think of people involved for many years, like General Samora Yunus. Does he yearn for a different future and not know how to get out of this? Could people like him change? There are examples of such. God gives people a way to turn around and change the direction of their lives. There is still opportunity for these people. Refuse to take the lives of others. We call on the TPLF/EPRDF to end the violence and begin addressing the issues. We must find a lasting and meaningful solution to the grievances of the people as expressed in the last weeks and months. To continue will be blatant evidence that the TPLF has lost any connection to the people of Ethiopia. The TPLF experiment in ethnic federalism— as a cover to rule the country— did not work and it will never work. Instead, it is threatening to destroy not only the regime, but the entire country. You in the TPLF/EPRDF are living a life of self-delusion causing you to fall into the trap you prepared for others. To compensate for the lack of support, the TPLF has attempted to be clever, but it is no longer working as people begin to critically analyze your tactics and use them against you. Now, those organizing the recent protests in Gonder, Oromia and those who are still planning protests in Oromia and in the city of Bahir Dar or in other places should be in communication so that people defend each other. Then, together, call on the regime of the TPLF/EPRDF to demand that they listen to the people and do the right thing— to stop the killing, to release all political prisoners and to start a dialogue leading to reforms, the restoration of justice and reconciliation. If this direction is taken, the formidable danger from a ticking bomb can be stopped. The TPLF will be the ones to benefit the most from such a plan or if not taken, the ones to be hurt the most by the increasing anger, resentment and determination to stop the injustice. Call on donor countries especially the United States of America, United Kingdom and the EU to be on the side of the Ethiopian peaceful reforms and the democratization of the country. If things get out of control in Ethiopia; diplomatic language that hides the truth, can actually backfire. This is the time to confront the regime as one people, standing up for a common vision and shared values that will work towards protecting each and every Ethiopian life and making sure the country does not disintegrate. What these protestors did by standing up for everyone is the only way out. Commit to protecting the lives, the property and the infrastructure of everyone, including our fellow Ethiopians, the Tigrayans, and the TPLF/EPRDF. May God help us to see the humanity of all of us. May He protect all the people of Ethiopia. © 2012 Durame. All Rights Reserved.